LabTest innovative universal servo-hydraulic testing machines with a new design, new more accurate and more powerful actuators and control units are designed for mechanically testing tension, compression, bending, shear and torsion strength of samples and whole products in a static or dynamic regime. Servo-hydraulic testing machines from the H.1 series are designed for safe and efficient testing of materials and complete products for tension, compression, bending, and shear stress. This series of machines is characterized by a highly rigid frame and mechanical resistance. The standard equipment includes a quiet and economical central hydraulic drive. Thanks to the large accessories the test machines from the H.1 series can be used to test any material and product up to Fmax. 500 kN. Vertical four-column servo-hydraulic testing machines H.2 Series are designed for safe and efficient testing of materials and complete products in tension, compression, bending, shear and special testing of high-firmness materials. This series of machines are characterized by high stiffness and mechanical resistance. The standard equipment includes a central quiet and economical hydraulic drive. 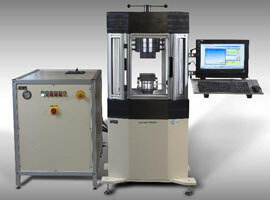 Due to the large range of equipment, H.2 Series testing machines can perform tests of any materials up to F max. 5 MN. Open four-column frame with high stiffness and good ergonomic design. The ergonomics of the workspace and sufficient width workspace enables easy handling of specimens and accessories. Robustness ensures high rigidity, durability and resistance to vibration. Quiet hydraulic drive with low noise level <68 db and low energy consumption, automatic checking of HA parameters and air cooling. Automatic control of the controlled loading in force and position loop through a proportional servo valve. The modular configuration of the machine with the possibility of adding any LABORTECH accessories, including special tools and clamps, extensometers, etc. Measuring electronics due to the high sample rate and high resolution AD converters allows a very accurate testing of a large measuring range of the sensor. Possibility of machine control via remote control RMC 7 a single button without using a PC. Multilanguage version of software Test & Motion. Servo-hydraulic testing machines H.3 Series with two reversing workspaces are designed for safe and efficient testing of materials and complete products in tension, compression, bending, shear and special testing of high-firmness materials. This series of machines are characterized by high stiffness and mechanical resistance. The standard equipment includes a central quiet and economical hydraulic drive. Due to the large range of equipment, and variability H.3 Series testing machines can perform tests of any materials up to max. force 1500 kN. Supports standards acc. ČSN, DIN, EN, ISO, ASTM, GOST. The innovated servo hydraulic universal testing machines LabTest for pressure tests with new design, new energy-saving hydraulic units and control units are designed for mechanical testing of compressive and flexural strength for steel slabs, concrete blocks, small bars and other components. The basic equipment of the machine includes a central quiet and economical hydraulic drive, pressure plate and a measuring and control electronics EDC 222. With a large accessories and variability, the machines of series H.4 can test any material in pressure forces of max. 6MN. The testing machines LabTest of series H.4 are divided into two categories, namely a two-column design up to 800kN and a four-column design up to 6000kN.